Here is a FREE 5 page sample of my NO PREP Trick Word Practice Packet ~ Level Two which includes practice for 84 trick words! Use for your whole class or small groups. I'm marketing to Grades 1-3 students. Although words support LEVEL TWO trick words, they can challenge and enrich some Grade 1 students or offer support or remediation for Grade 3 students. * Write It - Students will write the trick word two times using proper letter formation. * Circle It - Students will find and circle the trick word within a group of different words using a variety of fonts. * Put It In ABC Order - Students will put the trick word and four other words in alphabetical order. * Use it in a Sentence - Students will create their own sentence using trick word, demonstrating understanding of sentence structure. * Fill It In - Students will box up the trick word. In my classroom, I use these practice pages in support of Wilson’s Fundations®; however you will find overlap with words included on the Dolch Lists and the Fry word lists. There is flexibility owning and using this packet. 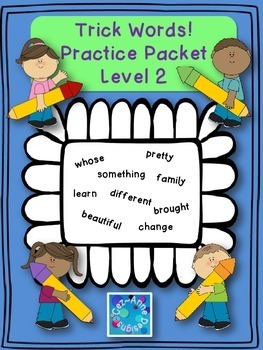 The practice pages can be used as an extension during unit lessons, as a center activity, or as additional practice for morning work or homework. Have fun mixing things up! This download is for one personal classroom use only. Duplication or sharing with other classrooms, co-workers, an entire school system, or posting on any website or blog violates copyright law. Thank you for understanding. After purchase/ download, please return to my store and leave feedback!